Shannon Shea has had a long and successful career behind the camera in the film industry. He has worked in the special effects department on memorable films like Predator, Terminator 2 and Jurassic Park. Shea got to work closely with Steven Spielberg and Stan Winston on JP as a credited Key Artist. We spoke to Shannon Shea about his time working on Jurassic Park and what he is up to now. 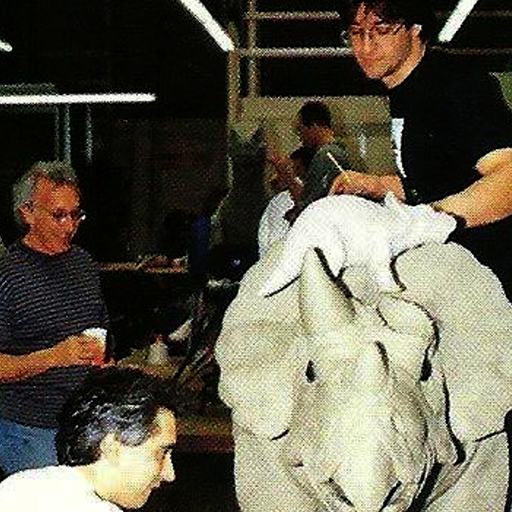 Shea working on a baby Triceratops with Stan Winston looking on. 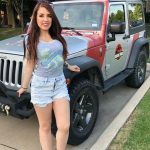 Can you talk a little bit about your role on Jurassic Park? I was one of the lead dinosaur artists working for Stan Winston Studios. My responsibilities included sculpting, molding, casting, painting and finishing some of the dinosaur puppets. I was also a puppeteer and worked on set with all of the practical dinosaurs in one capacity or another, with the exception of the Brachiosaurus. You have worked in the industry for a long time in a lot of different departments—what made your time on JP standout from all your other work? 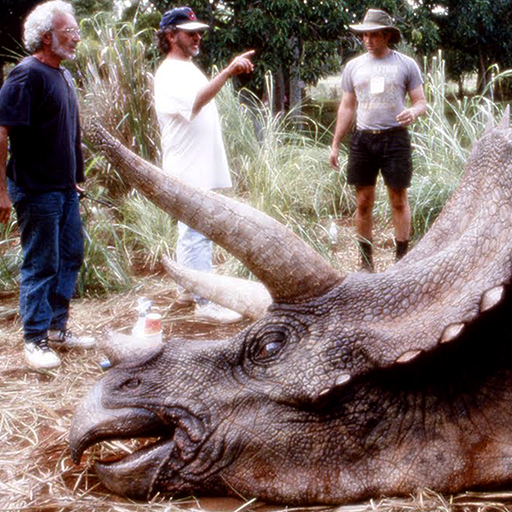 Jurassic Park, in my opinion, was the thesis film for most of us who had been working in practical creature effects. The time and budget afforded us for this project was unprecedented and never again repeated for another film. Stan Winston had assembled the best team available and led us into making motion picture history. Prior to Jurassic Park, no one had succeeded in making puppets and animatronics (at this scale) that were able to perform so well on set. Jurassic Park recently celebrated its 25 Anniversary, why do you think the film has remained so relevant for so long? It is a solid film. Yes, it exists prior to the Internet explosion and Smart phones, but technologically it still delivers as intelligent entertainment. It effectively presents high-concepts in an easily digestible way and then delivers dramatically on those concepts. I’m referring to genetic engineering, human interference with the natural order of things and, of course, Malcolm’s Chaos Theories! Amazing cast. Everyone is SO good! 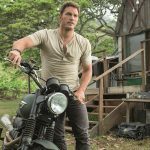 You feel sympathy for all of them (including Nedry) and that is because the actors were all so committed to their roles. The Production Design led by Rick Carter is outstanding! The look of Jurassic Park made audiences wish that it was an actual tourist destination. The dinosaurs. Practically and digitally. I think the success of the digital dinosaurs was that they had to match the existing puppets. Therefore, that limited the digital dinosaurs from performing any of the “physics defying” stunts that so many contemporary digital characters are guilty of. The digital dinosaurs were being compared directly to dinosaurs that were on set and so they needed to feel “as real” as our puppets. Were the special effects and practical dinosaurs as impressive on the set as they were in the final film? 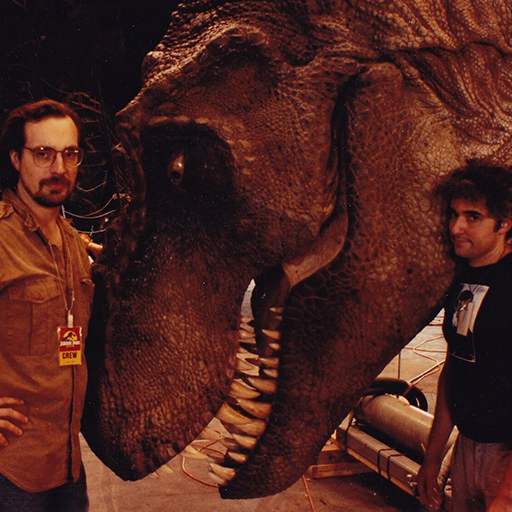 Mike Trcic (Left) & Shea on the set of Jurassic Park. 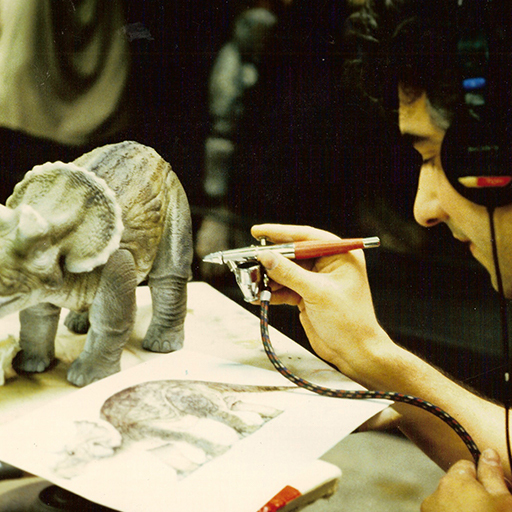 What is your fondest memory of working on Jurassic Park? That isn’t fair. There were so many good ones, but I will say that the most gratifying was when we presented the Sick Triceratops to the cast and crew. Joey Orosco led the Sick Triceratops team and he is a phenomenal artist. It was good luck that the first full-sized dinosaur everyone saw in its environment was his. It set the tone for the rest of our involvement with the project. And Stan Winston, being an incredible showman, had us all puppeteering the Triceratops as everyone walked up to it, so it seemed so alive! It was very impressive; the cast were all very complimentary. 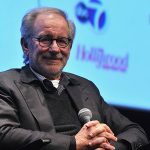 Did you get to work closely with Steven Spielberg at all? If you did, what was that like? Steven Spielberg is extremely focused and prepared. 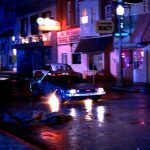 I had never experienced any director working quite like that and I had worked with James Cameron on Terminator 2 and Jim was very focused. For example, Steven had production build a scaled down representation of the kitchen made out of wood and foam core. He would take a tiny video camera (which was not that small in 1992) and set up shots and figure out all of the angles and challenges months before we filmed. As a result, we would speed through set ups and only shoot what we needed for the scene. It was very efficient. 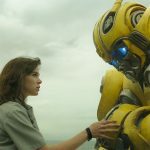 I have worked on so many films where we would shoot with a puppet and the director would get their shots and then say things like: “Just move the puppet around; let’s see what it does.” This would give the editors “cut away” options of the creatures to insert later into the film if needed. Steven never did this. We shot what we needed. He was so confident and shot only what he wanted. 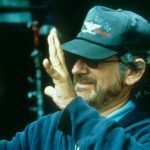 Spielberg, Winston and Shea on JP set. What was it like working with Stan Winston during your time at Stan Winston Studio and on Jurassic Park? 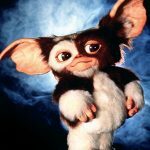 For me, that was the beginning of the Stan Winston pedigree. Again, it was his thesis statement. I had worked with Stan on Aliens and Predator, etc., but with Jurassic Park, he showed the world that he was capable of doing just about anything. Unfortunately, this would be the last time I would work with Stan due to differing opinions about the direction of my personal career. When I initially worked there in 1985, Stan was a relatively small studio with an intimate group of permanent employees and with the success of Jurassic Park, his studio was transitioning into a huge creature factory with defined departments and hierarchy. I was too much of a “hippie” to conform so quickly to that model and we (very amicably) parted ways. That said Stan did more for me than I realized at the time. He was a good editor, a fearless leader, a calculating risk-taker, a shrewd businessman, a dedicated husband/father, and a sensitive artist. He was a standard that I realized later, that I was attempting to live up to. I miss him. Are you working on any projects right now that you wanted to share with us? 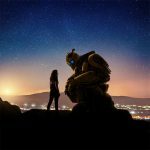 I just finished working with Disney R&D on their Stuntronics project through Spectral Motion, Inc. and I am happy that the Robot I supervised at Spectral Motion for Netflix’s Lost In Space show is going into Season 2! Brian Steele IS the robot! I am so proud of him and our amazing team that brought that character to life. Now, I am relocating closer to my original home in the Gulf Coast. I just completed welding class with the aim of building some full sized dinosaur sculptures for my new acreage! I guess once you build big dinosaurs, you just cannot get enough of it! Is there anything else you wanted to talk about or mention?